Healing & Wholeness: Complementary and Alternative Therapies for Mental Health provides a comprehensive overview of complementary and alternative treatments for mental health, with information and research on their effectiveness for treating specific disorders. The therapies covered are both state-of-the-art and ancient, including naturopathy, psychotherapy, hypnotherapy, nutritional therapy, herbal medicine, meditation, as well as others. This 650-page compendium of integrative and holistic therapies provides the reader with access to a multitude of options for improving their mental health. This is a thorough guide to alternative therapies in the mental health field, organizing a large amount of information in a relevant, easy-to-use format. Healing & Wholeness: Complementary and Alternative Therapies for Mental Health can be used as a standard reference for the mental health care professional, the graduate student, or anyone looking to improve their emotional health. 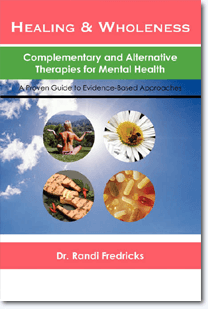 Randi Fredricks, Ph.D. is a psychotherapist, researcher, and author who specializes in the treatment of mental health using integrative medicine and natural therapies. Her other books include Healing & Wholeness: Complementary and Alternative Therapies for Mental Health. She lives and works in San Jose, California. To learn more about Dr. Fredricks’ psychotherapy practice visit DrRandiFredricks.com.